Dr. Lwabanya Marx, MD and EMHL, has been appointed to be Medical Director of Nundu Deaconess Hospital. Dr. Marx was born at Nundu Hospital and was raised only seven kilometers from the hospital. During the war he and his family fled the Congo, and he spent his teen years in a refugee camp in Tanzania. 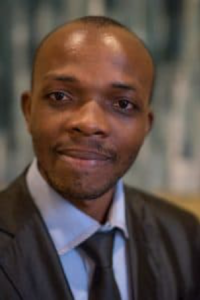 He returned to the Democratic Republic of the Congo to attend medical school, graduating from the Université Officielle de Bukavu, with a degree in general medicine. 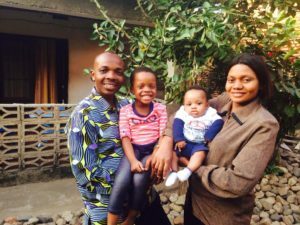 He went on to take a staff position at the Van Norman Clinic in Bujumbura, Burundi, where he has been working closely with Dr. Randy Bond, Dean of the Frank Ogden School of Medicine, Hope Africa University (HAU). In 2015 Dr. Marx applied to the Executive Health Leadership Master’s Program (EMHL) of Brown University and received a scholarship, completing the program in December 2016. Dr. Marx was awarded the 2017 Master’s Award for Professional Excellence for his outstanding contribution to the advancement of maternal and neonatal care in developing countries. He focused his EMHL Critical Challenge Project, a capstone requirement for Brown Executive Master students, on the development of a neonatal center and a nurse training program at the Van Norman Clinic. His programs include practical and applicable solutions to the problems of overcrowding and the lack of facilities and trained personnel equipped to deal with premature babies. He also developed online training for neonatal care nurses. In addition, he is working to establish a peer-mentoring program for at-risk mothers. His entire project can be viewed on http://friendsofhau.org/. After taking on his new role as Medical Record, Dr. Marx reached out to the Brown University EMHL faculty. His comments capture his commitment to the healthcare needs of his people. Thank you for your prayers as we are preparing for this move. I am going alone at first; my wife and the kids will stay in Bujumbura for a while and join me later. My wife is also interested in learning some infographic designing and video making here in Bujumbura so that she can help us working on stories on our work. Going back to Nundu is a great honor for me to serve my people, my church. I am referring this to the word of God from Nehemiah. The hospital is in the condition of Jerusalem at the time of Nehemiah (Nehemiah 2:17). I am … inviting the people to join us, rebuild this hospital. I have a dream of seeing Nundu Hospital to be the reference for maternal and infant care in South Kivu. For additional comments and information you may refer to the Brown University Website.